Species of Note: Not much, a quiet cold day! Obscurity Rating: 1/5 - Signed trail in a well-known Conservation Area. This is the first "real winter" day I've had in Hamilton in a long time. The wind is cold, the temperature is under -10° Celsius, and there's actually half a foot of snow on the ground. I chose to head in here today as I drove by yesterday and saw a lot of people parked off Middletown hiking in -- never knew about the side entrance so I was curious if there was some different trails to check out. The trails are basically the same it appears though, which isn't too bad for me as Christie is one of the very few CAs in the area I had not visited yet. It had always thought of it more as a "family camping" focused CA, rather than one with a lot of hiking trails. There appear to be a few trails though, enough to come back multiple times and not have to repeat the same path. 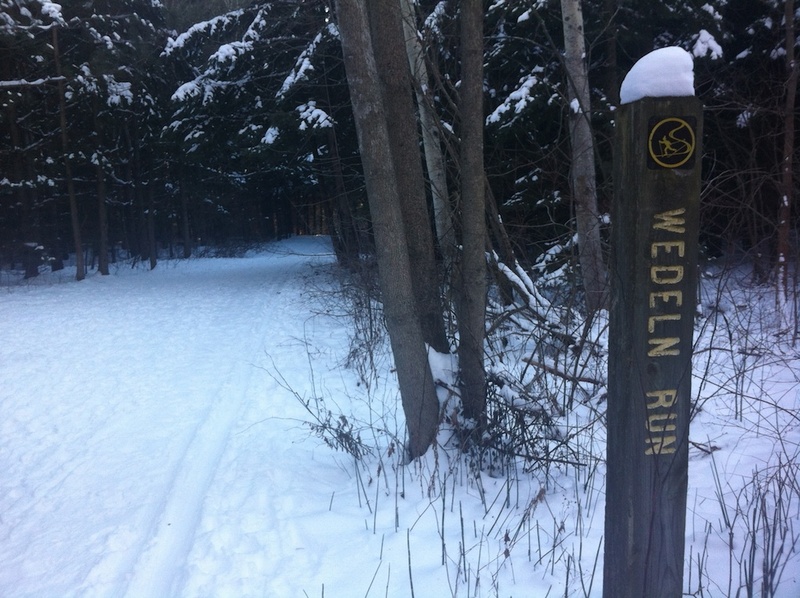 Today I took a walk about half-way through the trail signed as the "Wedeln Run". I'm not sure if Wedeln is a name or in reference to the downhill skiing technique. If it's the later, that would be a bit strange as any skier on this trail will most definitely not be going downhill at any point. The trail runs straight through a restored evergreen woodlot, followed by a more traditional deciduous forest, with occasional peeks at the Christie Reservoir. The lake is fully frozen over -- likely a long time coming -- I hope to return in the summer for some lake canoeing, as apparently you can rent canoes here!